What is the COP (Coefficient of Performance) in HVAC? The Coefficient Of Performance (COP) is a performance rating that tells us how effective a heat pump or air conditioner is at transfering heat versus the amount of electrical power it consumes. Remember, heat pumps and air conditioners move heat from a low temperature area, and pump this heat "uphill" to a high temperature area, and against the laws of thermodynamics (Heat Laws), which says that naturally heat flows from something that is hot, to something that is cold. This "uphill" movement of heat from a low temperature area, into a high temperature area, thus requires work, and the COP says how effectively a heat pump or air conditioner performs this work by telling us the amount of power required by the machine to move a certain quantity of heat, at a certain temperature, from a low temperature area to a high temperature area. So, if you've ever wondered how much heat a air conditioner or heat pump can transfer, given a specific amount of power, at a specific temperature, then the COP is what your looking for. COP is typically used to describe a heat pump's heating performance while it's operating in heating mode, however, COP can be used to describe cooling performance for air conditioners as well. For the majority of this article we'll be using examples of the COP for an air source heat pump in heating mode, because as we'll soon find out, a heat pump operating in heating mode has a very high COP, and this make's understanding COP easier. Now, before we continue with the differences between the COP and other efficiency ratings, it's important to note that, although minimum COP standards are only set for geothermal heat pumps and commercial air source heat pumps, this doesn't mean the COP isn't a very useful tool for other types of HVAC systems as well, including the smaller, and more commonly used air source heat pumps and air conditioners like the kind most of us have at home that come in at under 5-tons of capacity. So, even though the COP is not required to be labeled on HVAC equipment, it's still a very useful tool we can and should use to view aan HVAC system's performance with. So, with that being said, let's get back to the differences between COP and other efficiency measurements: If you've been reading through our other articles concerning other efficiency ratings we've discussed thus far, you may have also noticed a few things these other efficiency ratings all had in common with each other, such as a factor of time always being involved. For example: SEER showed us energy efficiency over the course of a cooling season, HSPF showed us energy efficiency over the course of a heating season, and EER could be used to show us energy efficiency over any period of time that we define. Well, the Coefficient Of Performance varies when compared to other efficiency ratings in this way too, because it demonstrates instantanious performance without any factor of time involved. That is to say, the COP tells us exactly how much heat a piece of HVAC equipment transfers when given a specific amount of electrical input power at a specific temperature, and therefore, at a specific and instantanious moment of time, instead of over a period of time like we've seen so far. So when we speak in terms of the Coeffcient of Performance, we are speaking in terms of instantanious performance, which means we speak in terms of power and not energy (Energy is power over time) and more importantly, output power vs input power. Which means, this output power to input power can be expressed as a ratio, and this is exactly what the COP is. COP then, tells us how much heat output power an air conditioner or heat pump transfers versus it's electrical input power. For example: A Heat Pump with a COP of 4:1, or 4, means that for every 1 unit of electrical input power put into the Heat Pump, it provides 4 units of heat output power. "That's impossible! So a Heat Pump defys the laws of physics as we know them and actually creates more energy than it uses? Hah!" Well, yes, that would be impossible, now wouldn't it? After all, it's a known fact we cannot create something out of nothing, and heat pumps make no exception to this rule, however, what they do may not be magic, but these machines do provide a larger quantity of output heat vs their input quantity of electrical power, and heres why: In order to understand how a heat pump achieves this greater output vs input feat, it's important to remember that: Heat pumps don't create/convert heat out of energy like a furnace does - A heat pump transfers heat from the outdoor environment, and then pumps that heat into a home, which is to say, heat pumps don't create/convert much heat at out of energy at all. It's this concept of transfering thermal energy versus creating/converting thermal energy which dicates that we use the COP to express a machines ability to transfer energy, and thus provide more output than input. When transfering available thermal energy from one area to another, it requires much less energy than it would require to create/convert that same amount of thermal energy out of electricity, or any other fuel source for that matter, which is why we use the COP to express a Heat Pump's ability to transfer heat energy, because it just so happens that they transfer more heat energy than their equivlant input of energy. So, rather than creating thermal energy out of electrical energy (which would imply efficiency), a heat pump simply transfers available thermal energy from the outdoor environment, and uses electrical energy to pump that thermal energy into the home, thus we describe this performance using the COP. This means the COP of Heat Pumps is always greather than 1 and is therefore is a ratio of performance, not a ratio of efficiency, because a machine with an efficiency greater than 1 would imply that the machine is creating something out of nothing, which is impossible. In order to understand COP, it definitely helps to understand how Heat Pumps use electrical power to transfer heat power into our homes, and since the COP typically refers to a heat pump's performance in heating mode, let's go over a quick example with a heat pump so we can see how a heat pumps heat output can be greater than it's electrical input. For example: A heat pump takes electrical input power, and provides heat output power into a home. That is to say, a heat pump uses electrical power to absorb heat from the outdoor environment, raise the temperature of that heat, and transfer this heat into the home, thus warming the home. Heat pumps do this in such a way that since the electrical power used by the heat pump to transfer heat into a home also gets converted into heat, that more output power in the form of heat is being put into the home than the amount of electrical input power being put into the heat pump, which is what makes heat pumps so efficient at what they do - They provide more heat to a home versus the amount of electricity they use because they transfer the available heat energy from the environment, including the heat created by the Heat Pump unit's moving parts, directly into a home. Using the example above: A heat pump uses 1000 Watts of Electrical Power to absorb 3000 Watts of Heat from the Outdoor Environment, and then adds 1000 Watts of Heat to this total, for a combined total of 4000 Watts of Heat being transfered into the home, with only 1000 Watts of Electrical Power actually being used by the heat pump to facilitate this transfer. 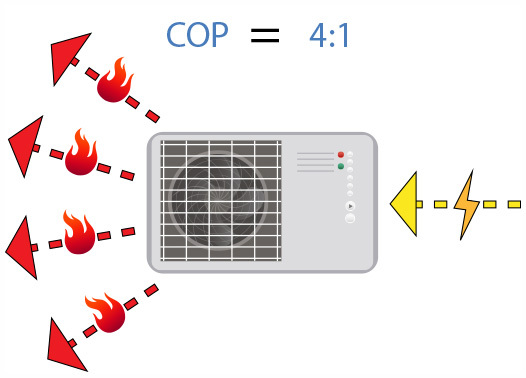 The COP in this example would be 4:1, or 4, which means for every 1000 Watts of Electrical Input Power being provided to the heat pump, the heat pump transfers 4000 Watts of Heat Output Power into the home, or, 4:1 - Power Out divided by Power In. "Wait a minute.. Watts of Heat? That makes no sense! I am confused! I thought Heat was only measured in BTUs? How can there be a Watt of Heat?" Ahh, yes.. 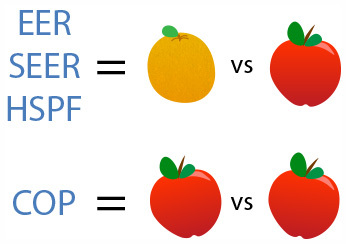 It does sound confusing now that we compare apples to apples, especially after learning about SEER, HSPF, and EER, which are all ratios that compared oranges to apples, now doesn't it? But, this is exactly what COP does, which is to say, COP compares two like things: Power Out to Power In, Apples Out to Apples In. However, this doesn't mean we can't simply convert Watts into BTUs/Hr, or into any other form of energy or power that we wish to express the ratio as - As long as we convert both sides of the ratio, we will still have the same percentages of things being compared. Remember: When comparing two percentages of the same type, we can call those two percentages whatever we want, but as long as we don't change the value of the total percentages we are comparing, we are still essentially comparing the same ratio of those things, no matter what we call them. So whether it be a comparison of 50 pennys to 100 pennys, or 2 quarters to 4 quarters, we still end up with half a dollar. Therefore, when it comes to the COP ratio, as long as we convert both the input and output types in the COP equation to the same thing, we are still comparing the same percentage of whatever type we are converting to (Apples to Apples, or Oranges to Oranges, Watts to Watts, BTUs/Hr to BTUs/Hr), and that means we still end up with the same ratio. Sound familiar? If you remember from one of our previous articles where we talked about EER, BTUs/Hr divided by Watt Hours of Electrical Power Input is actually EER, which is an apples to oranges comparison. This means converting COP to EER, or EER to COP, is easily achieved by converting either ratio's numerator between Watts and BTUs/Hr. Now, as stated earlier it's important to remember that COP is a ratio of instantaneous equipment performance at a specific temperature, but in the above examples no reference to temperature was given, so what gives? So, our above example didn't list any reference to outdoor or indoor temperatures, but that's because we were just using a COP of 4:1 with a 4000:1000 Watt Heat Pump as an example to explain how the COP works. Real COP values are instantaneous values that represent performance at specific indoor and outdoor temperatures, and they also differ between a heat pumps cooling and heating modes. This means, there are 2 COP values for every heat pump - One COP is for cooling mode performance, while the other is for Heating mode performance. So how about we examine and calculate the COP of a real heat pump and see how these values and temperatures actually affect performance? Now, as stated earlier, unfortunately the COP is not a performance rating that is required to be labeled on residential HVAC equipment in the United States, so you probably won't find COP data listed on the data plates located on the side of your HVAC system's components (we never have! ), however, this data is usually listed in product specification data sheets, which can be obtained from equipment manufacturers. The best way to go about getting a product specification sheet for your equipment is to ask your contractor, or by getting in touch with the manufacturer of your HVAC system. Contractors have accounts with manufacturers, and the dealers who sell the manufacturers equipment, and as such an HVAC contractor can easily pull this data for you either by asking their equipment dealers for it, or by accessing a special contractors section of a manufacturers website and pull it themselves. You can also try searching the internet for product specification data sheets for each of your equipment's model numbers, but remember, you'll need the product specification sheet for the entire HVAC system which includes performance data obtained from testing all 3 pieces of equipment and therefore all 3 models numbers from your entire HVAC system, including the: Outdoor unit, indoor coil, and indoor furnace, which can be difficult to locate. If you can't get a product specification sheet for your HVAC system, this limits your scope and percision of the COP data you can obtain. Without a product specification sheet you're essentially limited to converting cooling performance COP from an EER, or calculating seasonal heating performance from HSPF. Cooling performance COP obtained from coverting an EER into a COP will be accurate, however, converting heating performance COP from a seasonal efficiency rating such as HSPF is technically inaccurate, and shows a COP for an entire heating season, which essentially goes against the way COP is supposed to be used as an instantaneous performance rating. Therefore, without a product specification sheet, it's best to stick to calculating the COP of cooling performance from an EER, which is all you need to do if you only have an air conditioner. If you have a heat pump however, it's best to obtain a product specification sheet to see the COP of the system's heating performance, otherwise you're limited to estimating heat performance through various ways. "Wait.. So there are 2 different COPs for heating performance? " Correct. There are actually many more, and techinically there is a different COP for every difference in temperature between both the indoor and outdoor environment the system is operated within, however, on this product specification sheet we are only limited to viewing the heating performance data at 2 separate outdoor temperatures, including 47°F and 17°F. So, if you recall from our previous article where we discussed HSPF, these 2 temperatures may look a little familiar to you, that is to say, these temperatures are the required outdoor environment temperatures used in evaluating a systems HSPF efficiency rating. Therfore, these 2 outdoor temperatures of 47°F and 17°F we're used when the system was operated against a single indoor temperature of 70°F in order to calculate HSPF, which is why only 2 COPs are listed. This brings us to an important point: Manufacturers don't have to list this performance data - The FTC (Federal Trade Commission) doesn't require that machine performance data be readily available to the public on a label, and this means you may not be able to obtain it as easily as you might wish you could. Trane, who provided the product specification sheet we used in this article, is one of these manufacturers who doesn't publicly list this information, however, Trane is nice enough to give this performance data to contractors so they can design and sell a Trane HVAC system, and since it correlates with HSPF, this data is also verified. "But.. Why are there 2 different COPs? Shouldn't the COP be the same for each temperature?" Unfortunately no, the COP changes and here is why: Heat pumps lose heating output capacity as the difference between the indoor and outdoor temperature increases. Remember, heat pumps "pump" heat from a cold outdoor environment, into a warm indoor environment, and against the natural heat laws of thermodynamics which state that naturally heat flows from something that is hot, to something that is cold, in order to equalize temperature. 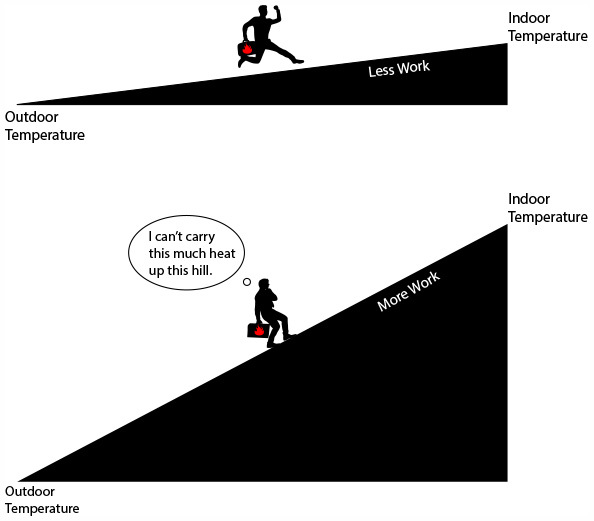 This action of moving against the natural flow of things requires work, in the same way carrying a bucket filled with heavy rocks up a steep hill and against the natural force of gravity also requires work, except with a heat pump, it's more like carrying a bucket of heat - The greater the difference in temperature between the indoor and outdoor environment, the steeper the hill, and the more work that is required to move the bucket of heat up the hill. That is to say, since a heat pump "lifts" heat "uphill" as it pumps heat into a home, this requires work, and sometimes more work than a compressor can provide, so it's forced to "lift" less heat "uphill". "Ok that makes sense. But, I have my product specification data, and it doesn't say anything about a COP for Cooling Performance. Where is that COP listed?" Alright, so our XR16's COP of Cooling Performance comes out to 3.6625:1, which means, for every 1 unit of electrical input power put into the heat pump, it outputs 3.6625 times as much heat. In this case, the heat pump is operating in cooling mode, which means it's transfering the heat outside of the home. As you can see, our heating performance is actually better than our cooling performance, even though the heat pump has a smaller heating capacity output vs it's cooling capacity output. This is the beautiful thing about heat pumps and it happens to be this way because some of the energy the compressor uses to compress and pump refrigerant get's converted into heat, which automatically get's absorbed into the whole heat transfer process and pumped into the house as heat, thus adding to the amount of heat being pumped into the home. Nice. The exact opposite is true in a heat pump's cooling mode (or an air conditioners cooling mode), the heat energy that the compressor adds is a bad thing, and therefore it has to be removed by the heat pump (or air conditioner), which is why you will usually find a greater heating performance from a heat pump when compared to it's cooling performance. "Ok.. so I have all my COP performance ratings, but just what does this mean? How do I actually use this information?" Right! So, what we need to do now is express our COP ratios as Watts of Output divided by Watts of Input. Our COP performance ratings right now simply tell us the difference between the numerator and denominator of our COP ratios. So, let's go ahead and convert things around into useful data. As you can see by examining the Trane XR16's product specification sheet, Trane was also nice enough to do this for us, and they went way out of their way to list the Watts of electrical power used by the compressor, condenser fan, and indoor blower fan when the heat pump is operating in high speed or low speed, and in both heating and cooling modes. Which means, if we wanted, we could simply add all these Wattages of Input from the different componenents up for each mode, and we would then have our Watts of Input, or the bottom half of our COP ratios. However, this may not always be the case, sometimes all you may get is COP, in which case, you'll have to do a little math to determine what your COP actually equates to in terms of Watts Out vs Watts In, so let's go over how this is done. Alright, so based off what we have above, we essentially have everything we need to express our COP ratios in the Watts Out divided by Watts In format, and even BTUs/Hr Out divided by Watts In format if we wanted, so lets do both! Alright! So our COP for Cooling Performance is now complete and the ratio is now expressed as Watts of Output versus Watts of Input. This means, that for every 2,736 Watts of Electrical Power put into the machine, it outputs (transfers) 10,020.6 Watts of Heat, or 34,200 BTUs/Hr for every 2,736 Watts. Nice! Ok, so we're done with the COP of Heating Performance at 47°F for this system, which comes out to mean that for every 2,498.21 Watts of Electrical Input, the machine Outputs (transfers) 9493.2 Watts of Heat into the home, or 32,400 BTUs/Hr for every 2,498.21 Watts. Let's solve for the last COP of Heating performance at 17°F, which is a scenario where the heat pump takes a huge dive in output capacity at 21,800 BTUs/Hr. And there you have it! 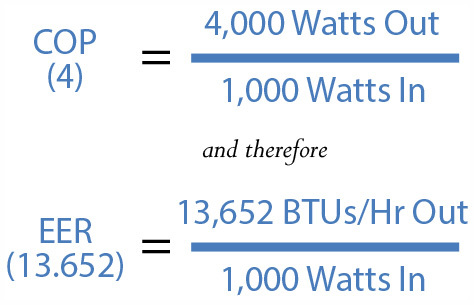 This ratio translates to meaning that for every 2,456.69 Watts of Electrical Input the heat pump transfers 6,387.4 Watts of heat into our home, or 21,800 BTUs/Hr of Output for every 2,456.69 Watts of Input. Awesome! "So.. I'm not looking to buy a new system and so I can't call a contractor just to pull COP data for me.. Is there a way to still find out my current system's COP?" Often people ask what they can do if they can't get their hands on a performance specifications sheet, which is a common issue, because for some reason obtaining COP performance data can pretty difficult unless you ask your contractor, and no matter what, it's pretty much always difficult when it comes to getting the COP of heating performance for a heat pump. Remember, an EER is a efficiency rating describing cooling performance! The EER test is performed while the equipment is operated in Cooling Mode, and at an outdoor temperature of 95°F and at an indoor temperature of 80°F. So, although it's very easy to convert an EER into a COP by multiplying the EER by .293, the COP you get out of an EER is only for the system's operation in Cooling Mode, and not in Heating Mode. Also remember: When searching through these directorys it can be very confusing, however, they all give you the option to search by equipment model number, which is usually the best way to go. Just remember, you need the model numbers off each component in your HVAC system, this typically includes 3 different model numbers: One for the outdoor unit, one for the indoor coil, and one more for the indoor furnace. This is because efficiency ratings are evaluated for an entire system during testing procedures, not just individual components, and this includes gathering performance data from each of the components as they function as an entire system. If you'll re-examine the XR16's product specification sheet above, you'll see how the Watts of Electrical Input consisted of Wattage from outdoor and indoor fans amongst other things, which means data was collected from the outdoor unit and the furnace, and this is because performance data is system-wide, not just per piece of equipment. So make sure you have all your model numbers when you search through these directorys! Otherwise, you may find yourself scrolling through a list of 20000+ HVAC systems! You may have luck searching for your COP of Heating Performace online. This is pretty much hit or miss when it comes to locating your HVAC systems COP, however, it's worth a shot, and you may get lucky. You can pretty much always assume that a heat pump's COP of Heating Performance is going to be greater than or equal to the COP for Cooling performance which you can convert from the systems EER (COP = EER X .293), because, as discussed earlier, the heat from the compressor gets added to the heat being pumped into the home when the heat pump operates in Heating Mode, which usually ends up making a heat pumps heating performance greater than it's cooling performance (However, it's capacity also usually drops, so don't assume too much!). You can also get a season-wide COP of heating performance by converting HSPF into COP in the same way that EER is converted into COP, and by multiplying HSPF by .293. However, you should read carefully over our section about HSPF! Remember: HSPF is based off the averaged weather data from a very few selected states within the US, which you may or may not live within, and HSPF also includes several other factors that essentially alter the heat pumps performance. This means, season-wide COPs for heating performance based off HSPF data are always going to vary from your actual seasonal heating performance! You can also try assuming that your machines input in watts is the same in heating mode as it was in cooling mode, and simply base the bottom half of your COP for Heating Performance off the Cooling Performance's Input In Watts and the top half of your COP on the Heating Capacities of the 2 temperatures (47°F & 17°F) that are listed in these directorys. Although, this is technically incorrect, because the temperature difference between indoor and outdoor temperature is greater in heating mode than it is in the EER cooling mode test, it can be used to help you arrive at an estimate of what your COP of Heating Performace is. This is usually the best way to assume COP if product specification sheets are not available and will get you the closest estimate to actual heating performance. So, with that being said, even if the directorys listed above don't list the COP for heating performance for your heat pump (they don't show COP because COP is not required), they still list very valuable information, such as the heating output capacities at 47°F and 17°F, which are very important statistics to have when your picking out a heat pump. As shown above, the Trane XR16's heating capacity dropped way down at 17°F, and this drop in performance is of course to be expected with a heat pump, but it varies from heat pump to heat pump, so it's always a good idea to check, especially if you live in an environment where the outdoor temperature drops to 17°F or below. The XR16s performance is actually very good for a heat pump, as often you will see heating output capacities get cut in half or even more when you get down to 17°F with heat pumps. And, even though the XR16's capacity wasn't halved, it still dropped an entire ton of capacity from 47°F to 17°F, which means, at 17°F this heat pump will probably still be able to keep the home warm, but it really depends on how long the outdoor temperature stays at or below 17°F. So, it's also important to remember: Performance data below 17°F gets worse, so if you live in a location where the outdoor environment often drops below 17°F a heat pump may not be the best solution for your indoor climate control problem. Remember, when the outdoor temperature drops too low, not only does a heat pump lose capacity, but it also freezes. During both of these scenarios the heat pump attempts to fill in the gap of lost capacity with heat created from running an auxillary back-up heating method in order to make up for the loss of capacity and heat the home. The length of time the heat pump defrosts also equates to a loss of capacity, therefore, the colder the outdoor temperature, the more the heat pump freezes and the longer it takes to defrost, which means longer back-up heating method run times. Typically, this back-up heating method that a heat pump uses when it can no longer keep a home warm consists of running a set of electrical heat strips inside an electric furnace (although there are other options available), and since electrical heat strips create/convert heat out of electrical energy, the maximum COP they can have is 1:1. This means, if your back up heating method is a set of 20 Kilowatt electric heat strips, that at a COP of 1:1, they have a input of 20 Kilowatts of electrical power and an output of 20 Kilowatts worth of heat! So, if you run these heat strips for an entire hour, that comes out to 20 Kilowatt Hours worth of energy consumption you have to pay the electric company, which can quickly add up to a large electric bill at the end of the month! This is one of the great things about COP - It allows us to paint a picture of system performance and gain yet another perspective of a systems performance and efficiency in a specific climate. So depending on how much you pay the electric company per kilowatt hour worth of energy consumption, using the COP you can imagine how often a heat pump system will be able to keep up, or not keep up, based on the climate conditions at your specific climate, and therefore how often it will end up using it's inefficient 1:1 back-up heating method. In this way, you can figure out which heat pump keeps a good capacity and a good COP within the range of outdoor temperatures your home experiences at your location, and which type of back-up heating method you may want to consider. This is exactly how the COP is supposed to be used. It allows us to evaluate instant performance, which we can easily compare to our own outdoor climate in order to determine if the HVAC system we are considering is going to function well in our own homes. In the case above with the Trane XR16, if we live in an environment where the outdoor temperature stays around 17°F for a long period of time, the heat pump we have picked out may or may not be able to keep up (It really depends on how long the temperature stays at or below 17°F), and therefore it may be wise to pick a different solution to our indoor climate control problem, such as a natural gas furnace, if natural gas is available. However, if the outdoor temperature rarely falls to 17°F, and hovers somewhere around 47°F or a little below during the winters, we know that our heat pump choice is going to perform very well with much higher COP and a much higher heating output capacity, and therefore this heat pump would make an excellent solution to a indoor climate control problem in an area such as Houston, TX - Not only does this heat pump perform best during the winter, it also performs very well in reverse during the summer, which means this heat pump would "kill 2 birds with one stone", and provide great and efficient results in both heating and cooling modes in an outdoor climate such as Houston's where the summers are long, and the winters are short and very mild. So as we see, COP is a great tool to have in our tool-box of efficiency perspectives. It's a shame that we have to do so much work in order to extract COP ratios out of the data manufacturers provide, and it would be nice if manufacturers were required to provide COP data as well, but unfortunately this isn't the case. Just remember, most of the time to obtain this data you're going to need to get your hands on a "product specifications" sheet (sometimes known as a "technical specifications" sheet), for the complete system your interested in, which usually means you'll have to contact your contractor. And, like all the other performance ratings we have discussed, the COP is just a single tool, and therefore a single perspective which we can use to view HVAC system efficiency and performance from. COP labels aren't required on HVAC equipment in the US, but by using this tool and doing the math we can see how it greatly increases our odds of selecting the right piece of HVAC equipment for our location, so it's important that we do. If we really wish to consider any piece of HVAC equipment for our own home, then we should always consult our own knowledge of the weather data in our current location as well as our own knowledge of our own home's construction and internal heat load - There are so many unique factors involved with every single home that simply aren't apart of any performance rating that makes using as many as we can, along with our own knowledge of our location and home environment, the key to any HVAC solution. COP is a performance ratio expressing instantaneous performance. COP is not required to be labeled on residential HVAC equipment, however, in some parts of the country EER is, and coinsodently an EER of 11 is equal to a COP of 3.2. The factors that affect actual energy consumption are: Everything!